2.Press down the work button for 3-5 seconds continuously, and then turn the fine tuning clockwise until the second green indicator lights on, and then turn the fine tuning counter-clock wisely until the green indicator put out. 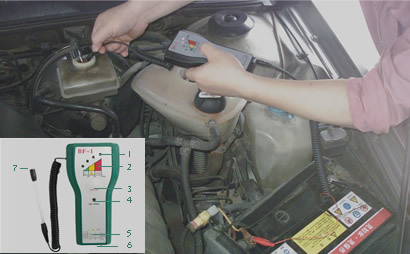 Now it can be used to test brake fluid. ＊Red light with buzzer sound indicates the brake fluid is very bad, waste content above 2.5%, the brake force decline seriously, and brake fluid should be changed!